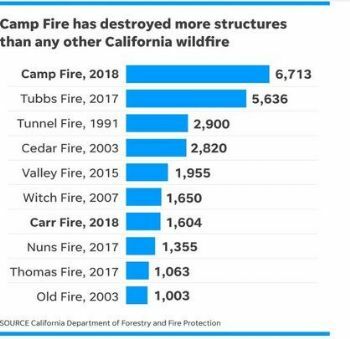 Note that 3 of the 10 (Camp Fire, Tubbs, Carr) have occurred in the past year. After last year's Northern California Firestorm (Tubbs was part of it), I hoped for a reprieve; although, realistically a reprieve was not expected given the enduring and deepening drought conditions enveloping the state. The Carr Fire that struck Shasta and Trinity Counties this summer was so ferocious it was shocking. Fire tornadoes? Really? Yes! The Camp Fire ,,, A fire which has destroyed over 100,000 acres, annihilated a town of 27,000 people and destroyed more structures in less than 48 hours than the Northern California Firestorm did in over a month. The Camp Fire has taken the top spot in the list as fire fighters begin day three of their fire fight. Expected containment is not expected until December. Harrowing tales of survival and loss are emerging. I have been particularly shaken by the tales from the educators and health professionals as they struggled to evacuate school children and patents as their schools and hospital were overcome by the fire. The fire moved so quickly that at least one bus driver evacuated their bus of student evacuees and directed them downhill on foot as they, literally, outran the encroaching flames. It has been reported that the fire advanced with the speed of a flash flood. How some of these folks managed to survive is beyond me. We are no strangers to such devastating fires. The Tunnel Fire of 1991 sits at number 3 on this list. Although we were not directly impacted by that fire, friends and co-workers were and indirectly our ability to get to and from work was severely impacted as transportation routes were cutoff. Unless someone has lived through such situations they are hard to imagine and describe. And, for those of us that have been touched by past events, the recent events can re-awaken past traumas. Our air quality is once again unhealthy. Air travel is being impacted at San Francisco International Airport. The impacts of these fires extend far beyond … I'm talking hundreds of miles … their immediate vicinity while burning. And, have ramifications that can last for weeks, months, years after the flames have been extinguished. My heart goes out to those being directly impacted by the current fires (both North and South of us). I know Northern California will experience extreme fire conditions beginning tonight through Monday morning. Southern California is expected to remain under extreme fire conditions through Tuesday afternoon. The fire fighters have their work cut out for them. And, there is only so much they can do. When fire conditions are this extreme, it is often necessary to ground all aircraft and pull ground crews back to protect their lives. Sometimes all one can do is step back, watch the fire advance, and listen to it roar. We are no match for Mother Nature. And, yes. Fires do have a voice of their own. They DO roar … like lions. And, yes, I have head the roars of both lions and fires. This such a sad and terrible thing for all that are going through it and the ones left behind. So many lives lost and it is still going. I pray it will be soon contained and put out completely. So many prayers for all involved directly and indirectly that all will work together to do what they can and yes I agree that Mother nature is not controllable. Thanks for giving us an idea of what is going on, Jeanne - over here in Germany we had a fire About 6 weeks ago in a military heath area over 300 km away from Bremen - a cloud of smoke moved north towards us and engulfed Bremen and Hamburg. So we can imagine the amount of smoke in the atmosphere in California - overwhelming… Hope you are doing alright and some answers are slowly coming in. Thinking of you and sending a warm hug! I moved from California last year. Lots of friends and coworkers are in harm's way. Very much in my prayers. I know several fire fighters and nurses who are on the front lines, too. Thanks for sharing! My heart goes out to all that this latest fire has touched. A complete town gone, I just can't wrap my mind around that. I am so angry that some people are making this a political issue. The suffering that people have gone through so close to us is heartbreaking. Sending love and energy to the firefighters, once again. How scary for all involved! Please take care. Oh goodness, how devastating. Prayers for the fire to be contained soon and for all of those in the midst of it, fleeing and fighting it. John and I have talked a lot about you and the fires. We continue to pray for you for this also. Your blog is excellent and does "say it all" like OKM said! Your blog title says it all... it's just staggering, the impact of these fires. Prayers. So tragic. Praying for all that are fighting the fires and those in the fires grasp.